We have a sweet new group of printed cottons from Art Gallery fabrics. Check out these cute bunnies! Everyone at the store oohed and ahhed over this adorable floral border print. We have so many new fabrics in the store! Come in and take a look! We have a springy new selection of lightweight cotton lawn prints at Treadle. We have many new dot prints. Splashy florals and bright, large-scale geometrics pack a punch, but don't over look the classic pin dot. It's easy to wear, doesn't overwhelm, and is always in style. We have a sweet selection of new coordinating ribbons at Treadle, featuring adorable owls, flowers, and leaves. The color palette is bright and fun, with bold hues against a cream-colored background. These delightful ribbons are printed grosgrain, which has a subtle ribbed texture without too much shine. Ideal for bags, purses, and crafts, as well as adorning garments. There is nothing more springy than beautiful ribbons trailing in the breeze! Stop by Treadle today and see our entire selection of wonderful ribbons! We have several new prints in our Organic section. What makes organic cotton different? Organic cotton is produced without harmful synthetic pesticides. This makes it a great choice for babies' and kids' garments, or simply to show your support for sustainable production by voting with your wallet. Plus, who can resist when the prints are this cute? New fabrics are pouring into Treadle by the bucketful! Today on the blog we’re featuring some bright new bottom-weights. From sateen in solids and stripes to heavy textured cottons, here are some heavier-weight fabrics perfect for pants, straight skirts, jackets, and bags. These are just a few of the highlights. Our Anniversary Sale continues through Sunday, April 13th! Stop by today and make your Spring bright! We have a new group of linen/cotton blends from Moda. The bright spring colors are delectably fresh, and the weight is just perfect for skirts and pants to take you into warmer weather. Remember, our Anniversary Sale is going on now! Enjoy at least 20% off every fabric and trim in the store through Sunday, April, 13th. 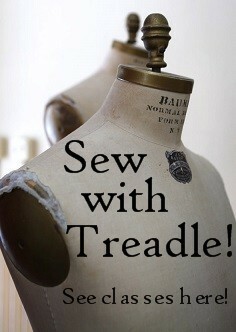 Treadle is celebrating 38 years! Join us for our Anniversary Sale, starting today, Thursday April 3rd! ALL fabrics are 20% off! That includes wool, silk, oilcloth, cotton prints, and so much more! Plus, all ribbons and trims are 20% off! Now's the time to pick up those gorgeous ribbons you've been coveting. Selected groups will have even deeper discounts! Look for 30-50% off selected fabrics and ribbons. Come in and see the whole selection! There is a floral for every taste at Treadle Yard Goods.